A remarkably attractive bird, the Royal Palm displays some of the nicest colors of all turkey varieties. These birds are quite small compared to other turkeys. Mature toms weigh 15-20 pounds and hens are considerably lighter at 10-12 pounds. They are striking in appearance. These beautiful birds have a white base color and most feathers are banded with a bright metallic black color. The contrast of this black/white combination is truly radiant. The Royal Palm is not a common variety and therefore we have a limited supply. St run means the birds are not sexed. They are sent as hatched, so we don't know how many males or females you will receive. will a tom be compatible with my chickens? We do not recommend raising chickens with turkeys. Chickens are carriers of a disease called Blackhead, which can be fatal to turkeys. The turkeys are straight run only. They do not go through the sexing process, so you aren't able to order just males or females. 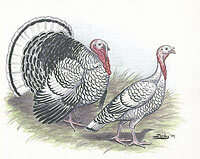 We sell turkey poults from May - August. Not really happyOrdered 15 arrived healthy and alter. Within 2 weeks they all suffered severely with splay leg. Nothing I did wrong nothing I could do to correct the problem. Sadly I am having to euthanize them one by one.